Los Angeles Immigration Attorney Nikki Mehrpoo Jacobson, Partner at The Jacobson Law Firm, LLP and a Dual-Certified Specialist in Immigration and Workers’ Compensation Law to Speak At Azusa Pacific University’s Immigration Forum to Address Immigration Policies, DACA, TPS and Due Process Issues. 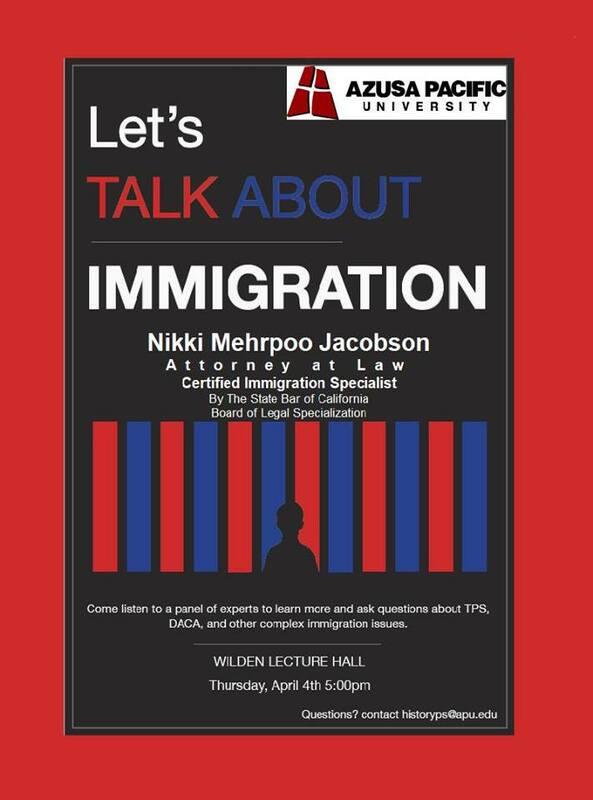 Azusa Pacific University will host students and community members at an Immigration Forum: “Let’s Talk About Immigration” on Thursday, April 4, 2019 at 5:00pm in Wilden Lecture Hall as a panel of immigration experts discuss the current climate of immigration law and policies and answer questions about TPS, DACA, and other complex immigration issues. The panel of experts include Immigration Attorney Nikki Jacobson, Partner at The Jacobson Law Firm, LLP, Rita Fernandez, Associate Director in Los Angeles Mayor Eric Garcetti’s Office of Immigrant Affairs and Emily Davies, Pi Sigma Alpha Chapter President, Department of History and Political Science at Azusa Pacific University. As a dual-certified specialist in immigration and workers’ compensation law by the State Bar of California Board of Legal Specialization, Attorney Jacobson is one of California’s leading voices for immigrants and immigrant workers. Growing up in California as an immigrant (refugee from Iran), Attorney Jacobson learned how to be an advocate at an early age because she was her parents’ voice. – a skill that has served her well as a vocal and knowledgeable immigration advocate and attorney. Attorney Nikki Jacobson is dedicated to advocating the rights of immigrants and to combating discriminatory actions against them. For over 22 years, she has represented and consulted with immigrants in every major immigration struggle, including challenging laws that deny immigrants access to the courts, impose indefinite and mandatory detention, and unconstitutional enforcement tactics by the federal government and local agencies. Attorney Jacobson understands that in a political climate increasingly hostile to immigrant communities, the need for accurate information about the latest immigration policy changes and what services are available is greater than ever. Signed Executive Directive #20 (“Standing with Immigrants: A City of Safety, Refuge, and Opportunity for All”) to ensure that L.A.’s public servants stay focused on protecting people, serving communities, and saving lives — not inquiring about immigration status or engaging in federal civil immigration enforcement. Mayor Garcetti is a leading force behind the L.A. Justice Fund — which provides legal assistance to immigrants facing deportation proceedings. The program is the result of a partnership between the City of Los Angeles, the County of Los Angeles, the California Community Foundation, and the Weingart Foundation. Because of this fund more Angelenos will have legal protection, more families will stay together, and more people will be able to build lives with the people they love, in the country they chose. Issued a Community Resource Guide for Immigrants in Los Angeles that includes comprehensive know-your-rights information and resources, including contact information for legal service providers and community organizations. The guide can be downloaded in English and Spanish at lamayor.org/KnowYourRights. Launched the Step Forward LA campaign to connect Angelenos who dream of citizenship with tools they need to check eligibility, locate classes and workshops, and explore a map to find the most convenient places to start this important journey. The campaign has reached 91,000 residents across the L.A. region with information on naturalization and citizenship. Attorney Jacobson and the other panelist will discuss the Mayor’s resources and address recent Immigration Policies, DACA, TPS and Immigration Due Process Issues. In addition, they will provide timely information to students and community members about “Know Your Rights” wallet inserts, free and safe immigration legal resources as well as employment legal assistance and discrimination issues related to immigrant workers, and domestic workers in particular. As federal policies impacting immigrant communities continue to shift, immigration seminars and immigration forums will continue to be imperative to the community in order to protect everyone from fraud and immigration scams and detrimental reliance on misleading information. Ms. Jacobson is a 1997 graduate of Pepperdine University School of Law and a member of the California State Bar. Ms. Jacobson is a nationally and internationally recognized speaker, legal analyst, media commentator, expert witness, lobbyist and legal consultant in immigration and workers’ compensation law. She regularly shares her valuable insight with the media and reporters from Billboard Magazine, France 5 TV, KIRN Radio 670 AM, Danish Newspaper Ekstra Bladet, as well as Business Insurance, WCAuthority.com and WorkersCompensation.com, analyzing high-profile immigration and workers’ compensation cases, court decisions and legal issues.